I was amazed and delighted that editors in the 1990s were looking for the kinds of stories that allowed me to start offering glimpses into Ethiopia, the land of my childhood. (Although I was born in Portland, Oregon, my parents moved to Ethiopia when I was two, and when I paid my first visit to the U.S. as a seven-year-old, I got to see for the first time how tightly many eyes and hearts were closed when it came to what I knew and loved best.) That brave new world of what is often called “multicultural literature” certainly came about mostly because of the outrage expressed by librarians and teachers and others who were asking, where are the books that show the mosaic of ethnic diversity in this world? Now I do have a granddaughter. She’s Ethiopian-American, and I want to do what I can to make her strong and confident for all the pokes and ka-bams I know for sure she’ll get, whether she grows up mostly in America or mostly in Ethiopia. 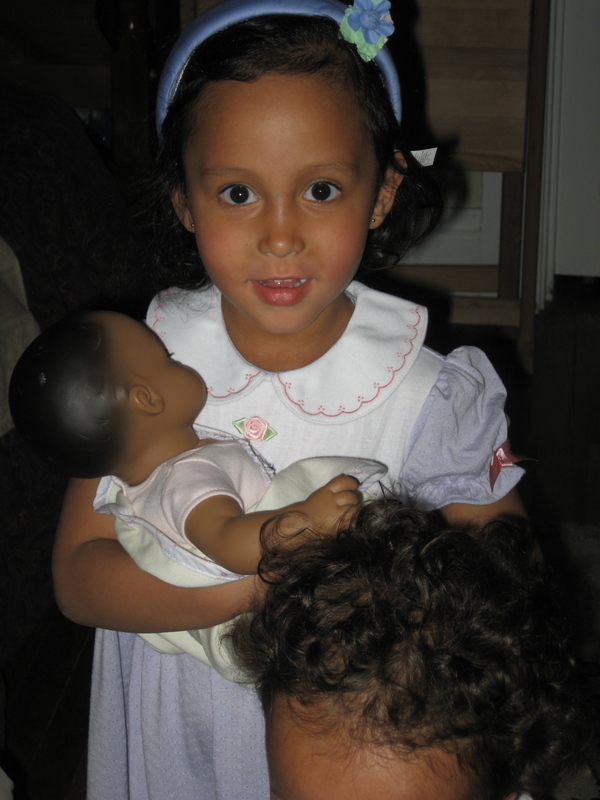 When I got ready to buy a first doll for her, I was pretty thrilled that American Girl makes the variety of dolls they do…and you can see her with her Bitty Baby (which her brother, whose head is poking up at the bottom of the picture, also thinks is super cool). We all get to decide how to be the Power of One in our world. For me, it isn’t going to be outrage any more, even though I admire the place that outrage played in creating the world of books and dolls we have now. It’s going to be writing and speaking about the books I love. I’ve seen the power of word-of-mouth to take fledgling efforts and turn them into a stream, and that’s the power I tend to be intrigued by and want to embody in my life. What people support will show up more and more in the world of publishing and toys…I know that for sure. Hmmm…it seems information about the new doll (and…ahem…my books) is leaking pretty fast, now. Maybe even officially. Once the blank covers went up on amazon with my name attached, speculation bubbled that the doll of the year would be African American. Okay, well, I did grow up in Ethiopia. I’ve been tickled pink–as my grandmother would have said–to be able to connect to Ethiopia with my books. In fact, I’m super proud that TROUBLE, originally published by Harcourt, got made into a bilingual Amharic-English book this fall, thanks to Ethiopia Reads, the nonprofit I’m semi-obsessed with. But any artist has to root around and keep digging to come up with fresh material. When I was seven, I knew I wanted to be an explorer and not bored or boring. I guess that’s still what I want. On with the adventure! What a whirl! I was doing an author visit at some international schools in Indonesia when I got an email from the editor who brought SABA: UNDER THE HYENA’S FOOT into the world as part of the “Girls of Many Lands” series that American Girl was trying. Those dolls–dressed to their fingernails in historically correct clothes from eight different countries–did not, alas, blossom in the hearts of their intended audience, and the line died a quick death. This time, the editor said, she’d like me to tackle the books for the Doll of the Year 2010. I flew to Madison, Wisconsin, to meet with the American Girl team, knew I was oovey-groovey with the theme, and signed a non-disclosure agreement promising not to reveal details until…ta-da…January 1, 2010. Then I went home to write. Can’t wait to break my silence.